Imagining the world without the web as an intellectual resource is almost impossible now. All those decades ago, applying for your research and travel grants to gain a foothold aboard ship or achieve landfall in another country, to see and hear academics speak, or to consult texts, is now long a thing of the past. With the advent of on-line resources comes the inevitable change in publication policy and the context of publication review and update. The two resources below represent some of the best examples of access to classic historical thought and an easy flow into current thinking and research. those persons with accredited Ph.D.s in Philosophy (or a related discipline) who have published refereed works on the topic of the proposed entry. 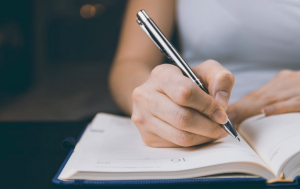 By refereed works we mean either articles in respected, peer-reviewed journals or books which have been published by respected publishing houses and which have undergone the usual peer review process prior to publication. However, what is interesting, is the editorial board’s commitment to review and updating of texts, which affords the invited authors of the works published the opportunity to amend , annotate or add to their original work as their research or trends in their chosen discipline demand change. It is the a way of using the web to refresh and renew the encyclopedia in front of your eyes, with an immediacy and currency that is generally impossible in traditional paper and binding formats. It doesn’t replace the book, it supplements it. You can read more about the Stanford Open Access publication model here. Some recently changed and updated texts in the encyclopedia include the following. There’s a great temptation to make it, for the enquiring mind, the only site worth bookmarking in your browser. See if you agree. Originally published in the early 1900’s by Harvard President, Charles W. Eliot, the works are freely available on-line from Project Gutenberg. The author of this short piece had a well respected friend who, in the early days of the internet (…the 1990’s now seem such a long time ago) was well read, but who decried the ‘web’ as irrelevant. Pages full of ‘blue links’ was how he described it. Whilst then perhaps an accurate description, it is is a terrible disparagement of the hyperlink. My response today would be to get him to click through to the Harvard Classics. Whether your interests are in Plato, Milton or Robert Burns there is much to enjoy here. The quotation above is drawn from Discourse on the Method of Rightly Conducting the Reason, and Seeking the Truth in Sciences by Rene Descartes, found on the Gutenberg bookshelf. A piercing insight into politics and management, as much as to science we think. You can also enjoy the fruits of the novelist too. Fiction from Walter Scott, Tolstoy and Balzac are freely available. Being tempted to read online offers choice in terms of format. All the works in the Gutenberg Harvard Classics canon are available in your web browser, ePub versions and for your Kindle or downloadable as plain text files. G.M. Trevelyan in English Social History (1942), quoted above, perhaps rather cruelly prefigured the future critique in Richard Hoggart’s work The Uses of Literacy (1957). Hoggart’s thesis was that the ‘massification’ of culture has detached communities and individuals from their traditional ‘urban culture’. That popular culture had de-classed society and debased, to some extent, the feeling for history or cultural connection across communities. Whilst it is inescapably evident that the internet and access to technology has irrevocably changed society, there is still a demand for classic literature and the wrangling with challenging thought. We think the modern, Western autodidact doesn’t necessarily spend long days in the community library anymore alas, rather he or she inhabits the web world to educate and inform the mind. We offer the hyperlinks above as evidence of our argument! Below are programme details for the event in full. Displays, re-enactments and research help will be delivered during the day. There will be an impressive range of talks across the day taking place in The Pavilion from 10.30am. (Our RSA Regional Chair, Malcolm Noble, will be officiating we understand…Ed). 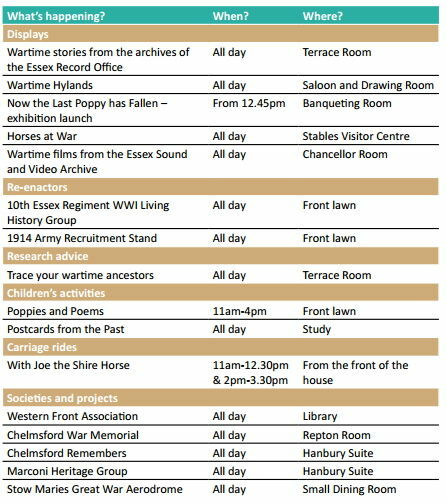 Importantly, don’t forget to visit the Chelmsford Remembers RSA team, who will be available all day in the Hanbury Suite of Hylands House. conversationsEAST will be there on the day, camera and notepad at the ready, so look out for a future, feature length article about the event and Fellow involvement in it. We do hope you will come along and support the Fellow led project at Hylands House. This is a glorious setting for such a wide-ranging event. There’s a lot of history in Essex, some of it researched and supported by Fellows of The RSA. ‘Each of us narrates our lives as it suits us…’ says Elena Ferrante in her novel Those Who Leave and Those Who Stay. it is possible to recognise the great truth in this reflection. We strive to become what it is we want to be, even sometimes presenting a face to the world that we do not, in truth, cleave to inside us. Now technology can map our journey from beginning to end. The humble laptop or mobile device can show this life track to the casual visitor. The wonder of the novel is it’s ability to draw us into the individual life, to be able to join the sole reflection of the journey. The visual displayed below shows the power of aggregation. Making moving pictures of the lives of many. From their birth to the place of their death. In the aggregation comes another story. It is an informative, broad brush canvas about the creation of communities, cities and centres of culture. It is also, to our mind, both art and science. Researchers at The University of Texas, Dallas have tracked the beginning and end of life of notable figures in history from 600BC to the present day. The database of notables was drawn from Freebase, a Google owned data service, and the skills and enterprise of the individuals is seen as a proxy for the spread of culture across the globe. It is a ‘western’ view of cultural dissemination. It omits much influence drawn from the movement of Asian and African peoples through time. One of the most stunning sequences in the film is the movement of people from the east coast of the USA to the west. It does visualise the rising importance of the West Coast, particularly in the Twentieth Century. Showing how inevitable the collapse of Native American culture had become. On balance, a great presentation that shows the cultural spread of European ideas, over space and time. You can find a thoughtful reflection on the novel by Elena Ferranti here. It is written by Rohan Maitzen. The original research was featured in the journal Nature: see Schich, M. et al. Science 345, 558–562 (2014). Freebase data is available for use under open license. Explore the contents here, you can see how to use the data more explicitly here. The Great War – the wrong turn to end all? The weekend of June 28th 2014 marked the centenary of the death of Archduke Ferdinand in Sarajevo, at the hands of Gavrilo Princip. Arguably sparking the events that put in train the First World War. …Ed.) It is unlikely that Princip, in his passion to undermine Austrian dominance of his culture, was thinking of the words of Thomas Hoccleve, see below. His ambitions were arguably localised, national, but the outcome of his act was trans-continental. With the destruction to come, the terrible devastation of war, linked to and having an unfortunate long echo back to the previous tumultuous tragedies in France during the 15th Century. The anguish is contemporary still. Allas! what peple hathe your werre slayne! What cornes wastede, and doune trode and shent! And drawen doune, and alle tortore and rent! Princip, part of a team of six Bosnian-Serb radicals dedicated to their plan, was standing outside a cafe in Franz Josef Street, reflecting on an earlier failed assassination attempt upon the Austrian Archduke by a co-conspirator that day. When, seeing the royal vehicle, engine stalled after taking a wrong turn, he leapt forward with his revolver, and from a distance of five feet, changed history. This story of ‘cataclysm by happenstance’ continues to provoke debate and divide about how the next few months saw progress into war, but also about the wider legacy of Princip’s actions, even after a hundred years has passed. The narratives still differ, both historic and contemporary, often in surprising ways. Modern Sarajevo remains a divided city, politically and culturally, to this day. With Princip seen as hero or devil depending upon the view of historical events taken from the city centre. To mark the Sarajevan centenary Andrew MacDowall, in The Guardian newspaper, has written an interesting and insightful article on how stands the political front-line concerning Princip. In Eastern Sarajevo, from the view point of the Serb Republic, Princip is a national hero,. His actions freeing the city from Austrian dominance. However, for the Bosnian Muslim population Princip’s actions bought about an end to a golden era of Austrian administration. The Muslim population look to the grand edifices of civil society, schools and railways of the Austrian Empire as evidence of their argument. Even after a hundred years, residents of a strife torn city cannot agree on a single, conciliatory view of their history. This set us thinking about that sunny day in 1914. What were, or what did, contemporaries to Princip think about the coming events and their out turn? We turned to the Project Gutenberg on-line library. Looking through the project’s World War 1 bookshelf we discovered, amongst the usual, deeply moving and contemporary military narratives, a surprising and very different view of events and understanding of the ‘culture’ of war, particularly of conflict in other places. This writer did not know of a Mills and Boon, Kiplingesque literary oeuvre developed around events of the war. Deeply at odds with the first person narrative of other, military writers, but perhaps born of a then contemporary optimism for Empire, incomplete knowledge and the heady ‘home by Christmas’ approach. Margaret Vandercook in her The Red Cross Girls with the Russian Army, (John Winston Co., Philadelphia, 1916) writes about war and combat as a sort of Mills & Boon romance adventure. Dashing young men in foreign places, capturing the swooning hearts of kindly young women. Published in 1916, it arguably represents a canon of juvenile fiction, that was blind to, or unknowing of the true horror of warfare at any front-line. There is a sort of breathless, adventure story pace to the book, at odds with the newsreel and written narratives we have come to know about the Great War and other conflicts in the 20th and 21st centuries. There is in this bookshelf collection a fascinating insight into the power of Empire and the loyalty created in military service. In Talbot Munday’s Hira Singh – When India Came to Fight in Flanders lies the fictionalised story of a group of Sikh soldiers captured by the German army in Flanders and transported back to ‘Constantinople’, who then escaped and marched overland to Kabul in Afghanistan to rejoin the British Army in their fight in Europe again. One hundred Indian troops of the British Army have arrived at Kabul, Afghanistan, after a four months’ march from Constantinople. The men were captured in Flanders by the Germans and were sent to Turkey in the hope that…they might join the Turks. But they remained loyal to Great Britain and finally escaped, heading for Afghanistan. They now intend to join their regimental depot in India, so it is reported. Although fiction, with some of the language jarring by modern cultural norms, and being written by a European, the story none the less provides insights into the nature of leadership, how men who were accomplished warriors from another culture, might have seen the conflict in Europe with empathetic eyes. The archive does not contain any reflection from Indian sources, but when looking at the contribution of the Indian Army and Marine service to the conflict, there is little doubt that support there was. How profound, prompted a look at the detail of the contribution of the Indian Army in the Great War? Details of the 1 million Indian troops who served in France, Mesopotamia and other battle zones can be found on the Commonwealth War Graves Commission web pages. Closer to home are a range of projects and community activities to remember the Great War in detail. One such is the work done by Fellows in Chelmsford, as part of a Heritage Lottery funded project – Chelmsford Remembers, and which will be launched as part of the Essex Remembers event, which involves both Essex County Council and Chelmsford City Council, to held at Hylands House on the weekend of 13th/14th September. Even after one hundred years, the local and social is as telling and moving as ever. Princip would probably still recognise the physical landscape old Sarajevo, if not the political one, whilst great new discoveries and insights lay waiting in the family archives of Chelmsford we suspect. A new web resource, dedicated to the art, politics and history of the great conflict. Referencing major UK museum collections, but also providing insights into history from a surprising variety of sources. A new resource offering insights into how ‘… it was the ordinary men and women who were affected the most. This exhibition gives those personal accounts from across Europe for the first time, based on stories and items contributed by the public’. In the last two weeks the BBC have launched a new set of web pages and content dedicated to the arts. The material , as you would expect from the Corporation, is diverse and stimulating, with a fresh feel in terms of web layout and visual impact we thought. It draws upon television, radio and web outputs to create a new miscellany. Below are some of the items we have found interesting at conversationsEAST this week. Both are of a historical bent, with historian Niall Ferguson opining on how young students now see and re-act to the First World War. A topical segment from the 2014 Hay Festival, with brief contributions from Rosie Boycott and Kate Adie. Niall Ferguson, ever controversial, begins by describing the teaching of history about the First World War in the UK as, essentially, education about the Home Front. The lack of familial links for young people to the events of 1914 onwards make the story of the Battle of the Somme as relevant as the Battle of Thermopylae, thus the concentration on social history. The Ferguson thesis on how students see The First World War is encouragingly developed to include how contemporary learners, Ferguson argues, are now very interested in strategic calculation and miscalculation. This is a credible argument for a return to interest in the prevailing political frameworks by students of 1914. The less comfortable summation is completed by references to the teaching of the impact of the First World War as a video game…perhaps something of an unfortunate trivialisation of all the stories of loss, destruction and bravery that will emerge as the centenary of the conflict is remembered this year? Have a look at the clip above and see if you agree? 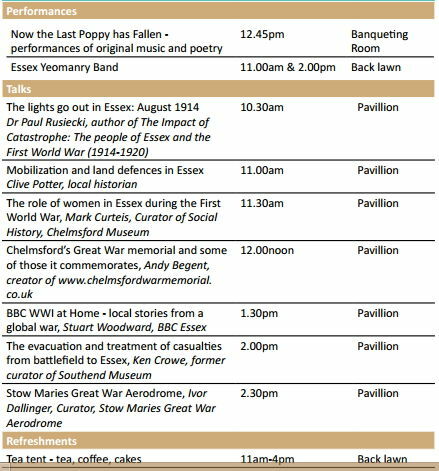 You can see details of Changing Chelmsford’s First World War: Then and Now programme on our projects page. This is a Lottery funded project between RSA Fellows and the local Civic Society which pertinently concentrates on the historical context of the Home Front, under-scoring the very real social and economic impact of war to the Fellows credit…despite the Fergusonian treatise on domestic history above. We also found on the new BBC Arts site a page link dedicated to the Scottish novelist, Denise Mina, who has created a social history film about her family, inviting them all to see the finished output at the Glasgow Film Theatre. See more here on this BBC Scotland web page. We loved the fact that the project was filmed on a smartphone, with very modest funding. The finished piece will be premiered today at the Go North Festival in Inverness. We thought what a great project, harnessing the power of ubiquitous modern technology, to create a story about a community. An ideal medium for a local arts/history project for Fellows in the region perhaps? Detailing the currency of everyday lives, to to be made enduringly available on the web.